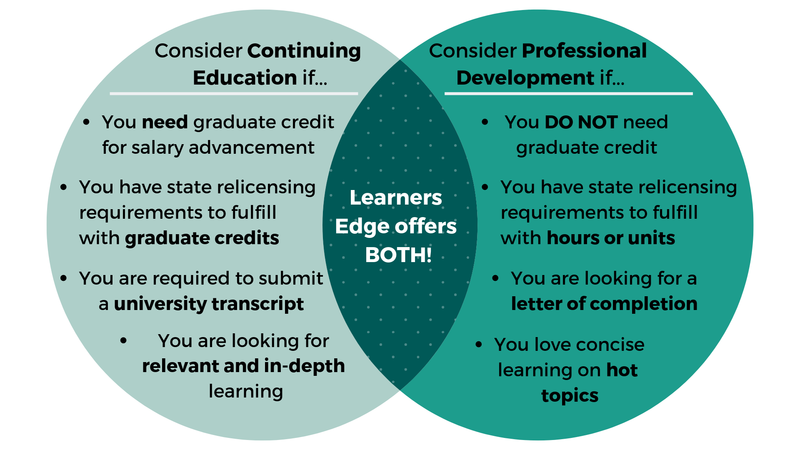 Below is a summary of how Learners Edge may help your continuing education and Louisisana teaching certification renewal needs. This summary should in no way release individuals from their responsibility of ensuring that the course they take meets their professional needs. We hope it provides assistance in understanding how Learners Edge might help you in the accumulation of clock hours or graduate credit for salary advancement and the Louisiana teaching relicensure process. See the Louisiana Department of Education website for complete LA teacher relicensure information. Level 1 Professional Teaching Certificate: renewed once after its first three-year period. Complete three years of Louisiana teaching experience in your certification area and have three years of positive evaluations by your school district. You must also pass the Louisiana Teacher Assistance and Assessment Program. You must complete 150 clock hours (CLU) of professional development during the five years between certificate renewals. You may earn one CLU for each clock hour of active engagement in a district- or system-approved professional development activity. You are responsible for maintaining records of your CLUs.